Long before the internet, ideas and goods were exchanged on trade routes. The Silk Road was an ancient network of land and sea trade routes that connected the East and West from 114 BC to 1450 AD. On this tour along the Silk Road in Uzbekistan, explore the religion of Islam and Muslim culture in a Central Asian setting. Interact with Muslim scholars and clerics; also meet Uzbeki orthodox Christians. As you retrace the historic migration trail of Mennonites who travelled from Russia to Uzbekistan in the late 1800s, hear about the opposition they faced and the surprising welcome they received from some of their Muslim hosts. Your heart and mind will be expanded as you examine intersections of faith and discover the cultural riches in this part of the world. Tour leaders John Sharp and Jim Juhnke are college history professors whose passion for and knowledge of the Mennonite Great Trek along the Silk Road will give you valuable insight into this chapter of Mennonite history. John and Jim have led several tours to Central Asia and have forged relationships with Muslims that will pave the way for enlightening interfaith dialogue. LISTEN to a dramatic reading based on the memoir of Elizabeth Unruh Schulz, a woman who was a part of the Great Trek. READ an article about the newly opened exhibit of Mennonite artifacts at the Ichan Kala Museum which you will visit on tour. After a long day of travelling, arrive in Istanbul and make your way to the hotel. Take part in a tour orientation to get to know your tour leader and travel companions. See some of the iconic sites of Istanbul, including the Golden Horn, a horn-shaped estuary that links the Bosphorus Strait and the Sea of Marmara. Istanbul has no shortage of houses of worship. Built under the direction of Byzantine Emperor Justinian I and dedicated in 537 C.E., Hagia Sophia’s cathedral is an architectural gem featuring great marble pillars, a main dome, and stunning windows. Now a museum, the Hagia Sophia is home to some of the world’s finest mosaic art. 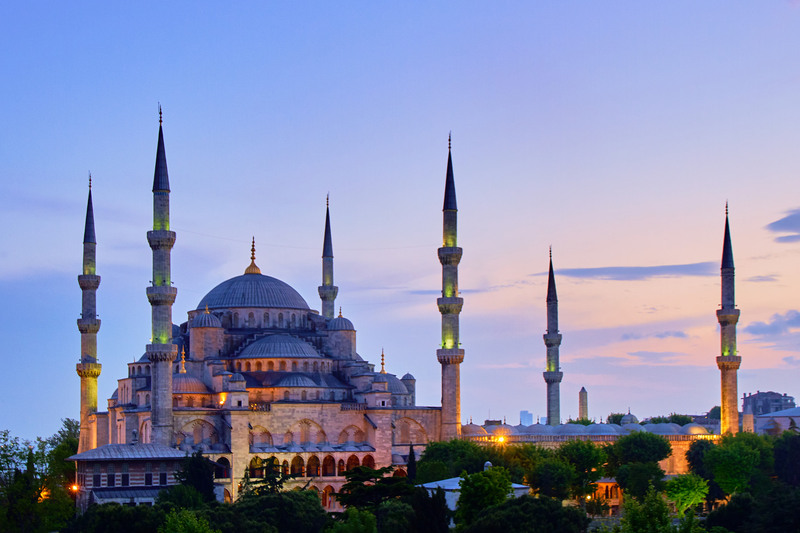 Across the way, the still-functioning Blue Mosque gets its name from the blue tiles that cover the interior walls. Later today, interact with an Orthodox Church leader, and see the traditional Christian and Jewish quarters of the city. Also, visit the Bulgarian steel church—built entirely out of cast iron. Continue touring houses of worship, as you visit the Mosque of Suleiman the Magnificent—one of the most beautiful and majestic of the Imperial mosques. Newly renovated, it features a great dome, gorgeous stained glass and ornately carved wooden doors. This morning, also see Topkapi Palace and Kariye Museum. Spend the afternoon cruising down the Bosphorus Strait, enjoying the sites of Istanbul from a different perspective. Dock in time to stroll through an Egyptian Spice Bazaar. End your day in the air on an evening flight to Tashkent. Arrive in Tashkent, the ancient capital of Uzbekistan, where Mennonites migrating from Russia on the “Great Trek” spent the winter of 1880-81. Rest in the morning, then take an afternoon city tour for a glimpse of this city’s modern sites and hear about its 2,000-year-old history. Catch glimpses of Independence Square, and view an ancient Quran in the Hazrati Imam mosque. John will read from historic “trekker” journals and talk about the Mennonite experience. During dinner in a Krgiz dzurta, (a traditional yurt), we will enjoy traditional cuisine, interfaith dialogue and explore Uzbek cultures and worldviews. Today, we travel through the Zarafshan Valley to the Silk Road to Samarkand, one of the oldest cities in the world, known as the Pearl of the East. Marvel at the city’s famous madrasahs, minarets, and, of course, the celebrated Mausoleum of Tamerlane which is richly decorated with carved wood and mosaics. See the Ulugbek Observatory, an important research site built in the 1420s, which helped ancient astronomers predict eclipses and calculate the length of a stellar year to be 365 days, 6 hours, and 10 minutes. View the Registan, a former public square dominated by three distinctive Islamic madrasahs. Evening engagements may include a conversation on intersections of faith traditions with local people of faith. Today, drive to Zirabuloq (Serabulak), where Mennonites spent nine months debating their final destination and leadership, and interacting with Muslim villagers. Visit the Kyk-Ota Mosque, shared with Mennonites. Here Mennonites worshipped, baptized, married and held funerals. We’ll speak with the imam and enjoy the hospitality of his brother through a celebration featuring traditional foods and games. This evening, make your way to Bukhara. Begin the day with a walking tour of the city, founded in 500 BCE. It was once the centre of trade, scholarship, culture, and faith. During the golden age of the Samanids in the 9th and 10th centuries CE, Bukhara became the intellectual centre of the Islamic world. See well-known sites like the Ismail Samani Mausoleum in Samani Park, and the Chashma-Ayub Mausoleum. Walk to the Ark, a massive fortress that contains a small town. See the Kalan Minaret, as well as ancient madrassahs and mosques. Once inside, visit the Juma Mosque and the Reception and Coronation Court where Mennonites petitioned the Khan for permission to settle in his territory. Experience the first shopping malls of the Silk Road, the multi-domed markets along the route where merchants led their camels. Spices, silk scarves, carpets, woodcarvings and jewelry are available to purchase in these ancient domes. For dinner, savour authentic Uzbek cuisine and then enjoy a cultural show in an ancient caravanserai. Continue the exploration of this ancient city. In the afternoon, we will leave this ancient city for another one, Khiva. We travel through the Kyzylkum (Red Sand) Desert to the ancient walled city of Khiva – one of the most remote cities along the Silk Road. From the comfort of our coach, we will learn about the struggles that the Mennonite trekkers endured as they crossed this harsh landscape. In Khiva, learn about and discuss significant contributions made by Muslim scholars such as Abū ‘Abdallāh Muḥammad ibn Mūsā Al-Khwārizmi, a Persian intellectual born around 780 who is credited as the founder of algebra. Our day begins with a short drive to Ak Metchet, a quiet village where Mennonite families were invited to settle after enduring raids by the Turkoman tribes. We’ll hear villagers recall the devastating Mennonite deportation from Ak Metchet to Tajikistan in 1935 and the women’s heroic resistance. Return to Khiva this afternoon, and visit the Itchan-Kala Museum, which features the history of Mennonites in this city. At Nurullabai Palace, view beautiful artifacts created by Mennonite craftsmen for the Khan (king) of Khiva. We continue our exploration of Khiva and visit with scholars to learn about the writing of a history of Mennonite who lived here, the first by an Uzbek. We will meet Mr. Karimov who had prepared an exhibit on German-speaking Mennonites who brought culture and agricultural expertise to this region—but because of the government’s fear of religious extremism, it never opened to the public. With a new government in place, the Ichan Kala exhibit on the Akmetchet Mennonites is being opened for the first time in 2019 and we will have the special opportunity to visit it. In the evening we’ll have time for interfaith and intercultural conversations. After a flight back to Uzbekistan’s capital, freshen up, rest, walk the streets or browse local shops at your leisure. Then, return to the hotel for a final meal together. Share memories and reflections from the trip, and say farewell.